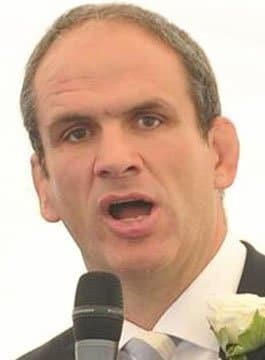 Martin Johnson CBE led the England Rugby Team to World Cup Victory in 2003. Born in 1970 in Solihull, Johnson is considered as one of the greatest rugby lock forwards of all time. Even before he lifted the William Webb Ellis Cup in Sydney on 22nd November 2003, he held a unique position in world rugby being the only man ever to captain the British Lions on two separate tours, to South Africa in 1997 and Australia 2001. Earlier in the year Martin had also led the England team to their Grand Slam victory in the 2002/3 Six Nations Championship, their first Grand Slam since 1995, and their first in the expanded competition. Martin’s international career began in 1987 when he played for the England 18-Group. He joined Leicester Tigers’ senior squad in 1989 and in the summer of that year, played for England in New Zealand and was selected to tour Australia the following year. In 1990, he made his Midlands debut, and in 1992 was selected for England B and the Barbarians. Martin made his England A debut in 1993. He has been involved in all 10 Five/Six Nations tournaments since his debut (1994-2003) and 3 Lions Tours (New Zealand 1993, South Africa 1997 and Australia 2001). Martin has also played in two previous World Cups in 1995 and in 1999 when he took over the captaincy. He was named the ’98/’99 Allied Dunbar Premiership Player of the Season and after being appointed the Leicester Tigers’ club captain in ’97 led the Leicester team to a Pilkington Cup victory, four successive Premiership titles 1999-2002 as well as the inaugural Zurich Championship in 2001 and back to back European Heineken Cup triumphs in 2001 and 2002. In 2008, Martin Johnson replaced Brian Ashton as the new England team manager, a position he held until 2011. Martin is available to present after-dinner and keynote presentations. During his keynote speeches, Martin delivers insights and lessons on Leadership, Teamwork and Motivation.